It is easy today to dismiss silent film as “sound film without sound”, but that is a mistake based on our preconceived notions. Silent film is, for a fact, a different medium, and when it works at its very best, that medium is not inferior to sound film. Just different. In the late 1920s, just before the break-through of sound film, the silent film had its artistic peak. At that point, some directors were experimenting with silence as an added dimension to the film, putting the images and their inherent story-telling abilities more in focus. One of them was Russian Dziga Vertov with his Chelovek s kino-apparatom (Man with a Movie Camera). It is relevant to ask whether Chelovek s kino-apparatom is documentary or propaganda. Well, in a sense it is neither. And both. Less and more. To the extent that the film has a story, it is the story of a man who goes around with a movie camera, filming whatever he chances to find. An onrushing train. People in a car. Even a woman giving birth (which is one of the film’s most powerful scenes, incidentally). But this thematic thread is so thin that we, the viewers, tend to forget all about it in the fascination over the fantastic imagery and visual playfulness that holds the film together. Since the film contains practically no title cards, the film’s messages are conveyed solely by means of the images. To state that Chelovek s kino-apparatom should be watched without a soundtrack is, of course, to stretch things a bit too far. 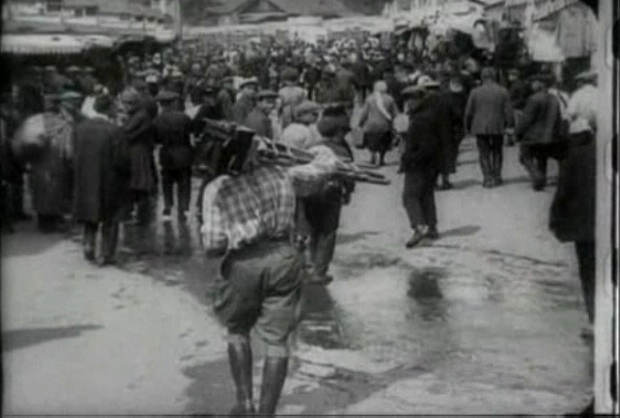 Vertov intended the film to be viewed with instrumental accompaniment. But at the same time it must be remembered that each of the many soundtracks that have been produced for this film gives it a different flavour, and in effect creates a different film. Therefore, in a sense, it may not be altogether a bad thing that the version available at the Internet Archive is without a soundtrack. It creates an incentive to watch the film bare-bones, and will perhaps allow the viewer to see the scenes from a fresh perspective. One that would not be possible with a recently written soundtrack, one which carries with it the composer’s interpretation of the images. This film is best enjoyed if you want to explore some of silent cinema’s greatest moments. This entry was posted in Avant-garde, Silents and tagged 1920s, 1929, City symphony film, Communism, Documentary, Economy, Film about film, Internet Archive, Silent, Soviet film, Surrealism. Bookmark the permalink.